Introduction: The purpose of obturation of the prepared root canal space is to prevent coronal leakage and bacterial contamination and to seal the apex from the periapical tissue fluids. Cold lateral technique has been considered to be a gold standard, however considering its limitations various thermoplasticized gutta-percha techniques have been recommended. This study compares radiographic quality of obturation in molar teeth, obturated with cold lateral condensation and thermoplasticized injectable gutta-percha technique (Obtura II system). Materials and Methods: Sixty patients were equally divided into two groups, Group A obturated with Cold lateral condensation technique and group B with Obtura II. Periapical radiographs were obtained immediately after the obturation using paralleling device method. The radiographs were examined by an observer, who was blinded to the group allocation. Data was compared using χ2 (Chi square) test and Independent sample t test was used to compare the mean ages. Results: Both groups were comparable in all respects such as tooth type, preoperative diagnosis and preoperative pain (P>0.05); however, more pre-operative radiolucency cases were allocated to Obtura II (P<0.05). There was no difference between the two groups, both in terms of postoperative voids as well as apical termination of the obturation (P>0.05). Conclusion: Within the limitations of the study, it was found that statistically there was no significant difference between cold lateral and obtura II technique, in terms of post obturation voids and apical termination, as observed in radiographs. The objective of this study is to compare the radiographic quality of obturation in molar teeth obturated with cold lateral condensation and thermoplasticized injectable gutta-percha technique Obtura II system. It was a quasi experimental design. The study was conducted at Aga Khan University Hospital, Dental Section. The duration of study was 1 year from March 2010 to March 2011. There were 60 patients enrolled for the study. Group A (control group) had 30 patients for cold lateral condensation technique, and Group B (intervention group) had 30 patients for Obtura II system. It was a purposive, non-probability technique. Group allocation was done on alternate basis. If the first patient was treated in Group A, then the second patient requiring root canal therapy was allocated in Group B. Permanent molars of upper and lower dental arches in which endodontic treatment was clinically indicated. Molars in which root canal treatment was recommended for elective reasons. Palatal roots of upper molars and distal roots in lower molar. In lower molar, with two distal canals, the disto-buccal canal was chosen. Teeth with severely curved roots. Sclerosed canals on periapical radiographs. Teeth not salvageable by conventional root canal treatment. Patients coming to Dental Section of The Aga Khan University Hospital, satisfying the inclusion criteria were included in the study. The data was collected on the prescribed performa and informed consent was obtained from all the patients. Preoperative periapical radiograph of the tooth in question was taken using paralleling technique with the help of cone indicating device, XCP instrument (DentsplyRinn). The selected patients were divided into two groups in the manner that the odd numbers were allotted to Group A (control arm) and even numbers to Group B (Intervention arm). Local anesthesia at 2% lidocaineHCl with 1:100000 epinephrine (2% XylocaineDentsply) as buccal infiltration in upper teethand inferior alveolar nerve block in the lower teeth, was administered. Access cavity preparation was done. Canals were located and negotiated with a DG-16 endodontic explorer (Franklin Dental). Initial filing was done from Number 8 to 10 H- files (ISO standardized 0.02 taper) under 5.25% sodium hypochlorite) irrigation and Ethylenediamine Tetra-Acetic Acid (RC-prep) as chelating agents. Gates Glidden Burs were used from No. 1, 2, 3 in sequence. Working Length was confirmed with Electronic Apex Locator Root ZX (J. Morita Kyoto), and then with working length radiographwas taken. Rotary preparation was done with Protaper (Dentsply Tulsa) using S1, S2, F1, F2, F3 files. Master gutta-percha radiograph was taken at the commencement of the first visit with Protaper F3 (Dentsply) gutta-percha point(taper 0.09) placed in the canals. Intervention was provided to both groups by the principal investigator. On the second visit, both the canals were dried with F-3 paper points (Dentsply). Root canal fillings were then performed using cold lateral condensation in Group A, and thermoplasticized injected gutta-percha in Group B. In Cold Lateral compaction, hand spreader was selected and then paper point was used to liberally coat the walls of the canal with calcium hydroxide sealer, SealApex (Kerr Manufacturing Co). Standardized Protaper F-3 (Denstply) master gutta-percha cone (taper 0.09) was slid to the working length and a measured stainless steel ISO standardized No. 25 finger spreader was applied under vertical loading for 10-60 seconds. This helped to deform the material both, apically and laterally. Withdrawal was with watch-winding motion to ensure that the master cone was not pulled free, and the first accessory cone was slid promptly to proper length with a light coating of sealer. Compaction and accessory cone insertion was continued; and, as the filling developed, each spreader insertion was seen to be slightly less deep than the previous one, as mirrored by shorter and shorter accessory cone insertion. Condensation was continued until the spreader reached no further than 2-3 mm into the canal. Heat was applied with Touch' N Heat device (Sybron Endo) to the root filling at or below canal orifice level, and the filling was then compacted apically with the help of a cold plugger. Glass ionomer cement was used as a lining to provide coronal seal, and the appropriate restoration was then placed. The Obtura II system (Obtura Spartan, Fenton, MO)was prepared according to the manufacturer's instructions. Application of slight coat of Calcium hydroxide sealer, SealApex (Kerr Manufacturing Co), to the canal wall was carried with paper points. A 23 gauge needle was selected and a rubber stopper was placed where it could reach 4-6 mm of the working length. The control unit of Obtura II was turned on, and the display showed the required temperature of 185°C after couple of minutes (according to instruction manual of Obtura II). The gun was loaded with a fresh pellet of gutta- percha and plunger was pushed forward. To preheat the needle prior to use, little gutta-percha was expressed out. The needle was then positioned in the canal so that it reached 3 to 5 mm of the apical preparation. 3-4 mm of the gutta-percha was passively injected without any apical pressure and was compacted gently with a #11 endodontic plugger (Caulk/Dentsply, Tulsa, OK) previously marked with rubber stopper to reach at least 3 mm short of working length. The plugger was dipped in alcohol, so that it did not adhere with the molten gutta-percha. Thus, the apical plug was created in this manner. A segmental technique was used in which 3 to 4 mm of gutta-percha were sequentially injected and compacted. Increments were added until gutta-percha reached up to the top orifice level, and then compaction was done with a cold plugger. Excess gutta-percha was severed at or below the orifice level with Touch' N Heat device (Sybron Endo). Glass ionomer cement (Ketac-Endo) was used as a lining to provide coronal seal, and the appropriate restoration was then placed. Postoperative periapical radiographs were obtained immediately after the obturation using a paralleling device technique. These radiographs were examined under illumination in a darkened room at ×2 magnification to assess for voids and termination of obturation. Our study was based on the radiographic assessment of the bucco-lingual view of the canals, as it was the only possible view to visualize on the radiograph in a clinical setting for assessing the quality of endodontic treatment, and to minimize the number of radiographs required for achievement of the study objectives. Presence or absence of voids. Acceptable/flush: Root canal filling is within the root canal system and within 2 mm of radiographic apex. Under-filled: Root canal filling is >2 mm short of radiographic apex. Over-filled: Root canal filling is extruded beyond the radiographic apex. The radiographs were examined by the consultant, who was blinded to the group allocation. Statistical Package for Social Sciences 14.0 was used for data analysis. For continuous variables like age: Mean and standard deviation was determined. For categorical variables like gender: Presence of voids, apical termination of obturation, quadrant of teeth treated proportion was determined as percentages. χ2 (Chi square) test was applied to see the difference between the two groups (Cold lateral Versus Obtura II) for outcomes, (voids and apical termination) at 5% level of significance. Independent sample t test was used to compare the mean ages. The mean age of the patients in the study was 35.48 years with a standard deviation of 8.27 years. As shown in [Table 1], there were 32 males in this study which were evenly divided in the two treatment groups, that is cold lateral condensation and Obtura II, and similarly there were 28 females which were equally divided into two groups. Both Groups were comparable in all regards (Tooth type, preoperative diagnosis and preoperative pain). 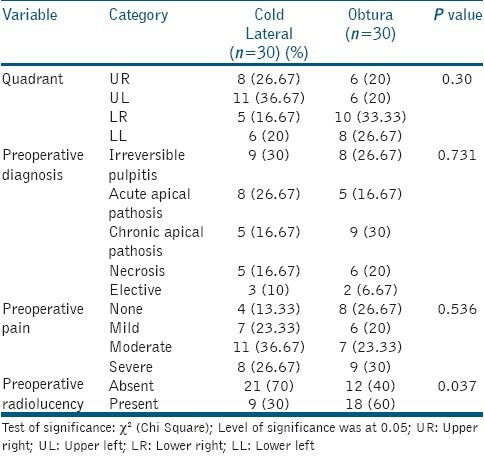 However out of 60 teeth, 27 teeth (45%) had pre-operative radiolucency, and it seemed that more pre-operative radiolucency cases were allocated to Obtura II, and this allocation was done as a chance factor, as our group allocation was done on alternate basis with no bias involvement as presented in [Table 2]. As shown in [Table 3], there were 53 cases (83.33%) with post operative voids and 7 (11.67%) had no postoperative voids. The distribution of post operative voids with respect to obturation technique showed that there was no statistically significant difference in their distribution. Regarding the termination of obturation, 52 (86.67%) were flush, 5 (8.33%) under-filled and 3 (5%) over-filled. The distribution of termination of obturation with respect to obturation technique showed that there was no statistically significant difference for their distribution as shown in [Table 4]. In France, a study using the same criteria for assessing obturations as in our settings found that 69% of the fillings had an adequate length of root filling, and 42.7% had a dense root filling without voids. In our setting, 30 obturations with cold lateral compaction noted 16.67% voids, 83.33% had an acceptable length, 13.33% were under-filled and 3.33% were over-filled. The above mentioned studies did not compare cold lateral compaction with other obturation methods. Most so-called problems with obturation are actually problems with the dentist's instrumentation. The obturation is in essence an impression of what the canal looks like after it has been instrumented. The appearance of the post-obturationradiograph actually shows the instrumentation or flaring of the canals. If the master gutta-percha cone does not seat all the way to the desired working length, it could be due to the debris present or because the flaring was not adequate. If the master cone goes beyond the apex, an apical stop has been violated. Limitations to our study were that it was a Quasi experiment, and not a Randomized control trial, as it did not conform to the CONSORT guidelines, which would have helped in making the groups more comparable and minimize the chances of bias as well as limit confounders. We adopted a quasi-experimental design because true randomization was not possible in our study design. For a true randomization, a sampling frame (a complete list of eligible subjects) was needed. Since this study was based in a single hospital that has limited catchment area, we could not have a sampling frame. There is no question that a randomized controlled trial is superior to a quasi-experimental design. However, we followed "alternate group allocation," which means that a subject recruited in our study had equal chance of being selected in the either treatment groups (cold lateral versus Obtura II). Thus, this alternate group allocation method resulted in eliminating the bias. Another limitation was that in lower molars with two distal canals, the disto-buccal canal was chosen'. In such cases, there is a possibility that voids/gaps in the disto-lingual canal would be superimposed on to the radiographic image of the disto-buccal canals. Since we had chosen only paralleling technique, without any mesial/distal angulations, the chances of such errors are increased. Three dimensional tools like micro-computed tomography should be used for assessment of obturation, so that limitations associated with conventional radiographs are controlled. Therefore, we recommend that prospective clinical studies conforming to the CONSORT guidelines are needed to assess the clinical outcome of the obturation techniques correctly by minimizing bias. There was no difference in Obtura II technique and cold lateral compaction regarding post obturation voids. There was no difference in Obtura II technique and cold lateral compaction for apical termination of obturation. 1. Cohen S, Hargreaves KM. Pathways of the pulp. St. Louis: Mosby Elsevier; 2005. 2. Weine FS. Endodontic therapy. St. Louis: Mosby; 2004. 3. Chu CH, Lo EC, Cheung GS. Outcome of root canal treatment using Thermafil and cold lateral condensation filling techniques. IntEndod J 2005;38:179-85. 4. Guigand M, Glez D, Sibayan E, Cathelineau G, Vulcain JM. Comparative study of two canal obturation techniques by image analysis and EDS microanalysis. Br Dent J 2005;198:707-11. 5. Anantula K, Ganta AK. Evaluation and comparison of sealing ability of three different obturation techniques - Lateral condensation, Obtura II, and GuttaFlow: An in vitro study. J Conserv Dent 2011;14:57-61. 6. Friedman S, Torneck CD, Komorowski R, Ouzounian Z, Syrtash P, Kaufman A. In vivo model for assessing the functional efficacy of endodontic filling materials and techniques. J Endod 1997;23:557-61. 7. Yilmaz Z, Deniz D, Ozcelik B, Sahin C, Cimilli H, Cehreli ZC, et al. Sealing efficiency of BeeFill 2 in 1 and System B/Obtura II versus single-cone and cold lateral compaction techniques. Oral Surg Oral Med Oral Pathol Oral RadiolEndod 2009;108:e51-5. 8. Peng L, Ye L, Tan H, Zhou X. Outcome of root canal obturation by warm gutta-percha versus cold lateral condensation: A meta-analysis. J Endod 2007;33:106-9. 9. Punia SK, Nadig P, Punia V. An in vitro assessment of apical microleakage in root canals obturated with gutta-flow, resilon, thermafil and lateral condensation: A stereomicroscopic study. J Conserv Dent 2011;14:173-7. 10. Schafer E, Nelius B, Burklein S. A comparative evaluation of gutta-percha filled areas in curved root canals obturated with different techniques. Clin Oral Investig 2011;1:661-5. 11. Mazotti D, Sivieri-Araujo G, Berbert FL, Bonetti-Filho I. In vitro evaluation of the obturation ability, adaptation and compaction of gutta-percha in the root canal system employing different filling techniques. ActaOdontolLatinoam 2008;21:3-9. 12. Xing L, Zhang TT, Hu N, Xu HP, Su Q. [Evaluation of the filling ability of System-B continuous wave obturation technique to artificial lateral canals in vitro]. Shanghai Kou Qiang Yi Xue 2010;19:541-4. 13. McRobert AS, Lumley PJ. An in vitro investigation of coronal leakage with three gutta-percha backfilling techniques. IntEndod J 1997;30:413-7. 14. Moussa-Badran S, Roy B, Bessart du Parc AS, Bruyant M, Lefevre B, Maurin JC. Technical quality of root fillings performed by dental students at the dental teaching centre in Reims, France. Int Endod J 2008;41:679-84. 15. Tani-Ishii N, Teranaka T. Clinical and radiographic evaluation of root-canal obturation with obtura II. J Endod 2003;29:739-42. 16. Ng YL, Mann V, Rahbaran S, Lewsey J, Gulabivala K. Outcome of primary root canal treatment: Systematic review of the literature - Part 2. Influence of clinical factors. IntEndod J 2008;41:6-31. 17. Cheung GS. Survival of first-time nonsurgical root canal treatment performed in a dental teaching hospital. Oral Surg Oral Med Oral Pathol Oral RadiolEndod 2002;93:596-604. 18. Torabinejad M, Bahjri K. Essential elements of evidenced-based endodontics: Steps involved in conducting clinical research. J Endod 2005;31:563-9. Rambabu, T. and Sasidhar, N.